Introduction Postoperative pulmonary complications (PPC), such as pneumonia and atelectasis are associated with poor outcomes following thoracotomy and lung resection, with risk factors identified.1,2 Video-assisted thoracoscopic surgery (VATS) is increasingly performed, however, there are varying reports regarding the incidence of PPC with little is known about their effect on short-term outcomes or potential risk factors. Methods A prospective observational study of consecutive patients undergoing VATS lobectomy was performed in a regional centre (2012–2016). Exclusion criteria included re-do VATS/completion lobectomy. All patients received physiotherapy assessment/intervention as necessary from postoperative day 1 (POD1). The presence of PPC was determined daily using the Melbourne Group Scale. Outcomes included hospital length of stay (LOS), intensive therapy unit (ITU) admission and hospital mortality. Results 287 patients underwent VATS lobectomy, 2 patients undergoing completion lobectomy were excluded. Of 285 patients; 137 were male (48%), median (IQR) age of 69 years (13) and mean (±SD) FEV1 of 87% (±19). 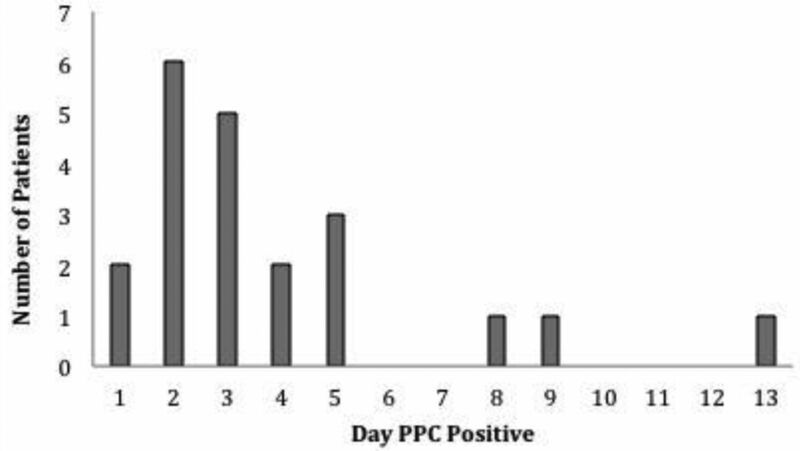 PPC developed in 21 patients (7.4%); the median day that PPC developed was postoperative day 3 (Figure 1). Patients who developed a PPC had a significantly longer hospital LOS (4 vs 3 days), higher rate of ITU admission (25% vs 0%) and higher hospital mortality (14% vs 0%) (p < 0.001). Current smoking and COPD diagnosis were significantly different on univariate analysis (p < 0.05), but on forward stepwise logistic regression, only current smoking was a significant independent risk factor for PPC (p = 0.015). Those with PPC required significantly more physiotherapy contacts/time, with more specific pulmonary therapy and emergency out-of-hours therapy. Conclusions Patients undergoing VATS remain at risk of developing a PPC associated with significantly worse short-term morbidity and mortality. Patients that develop a PPC following VATS required increased postoperative physiotherapy compared to non-PPC patients. Current smoking is an independent risk factor for PPC development following VATS, thus vigorous addressing of preoperative smoking cessation is urgently needed. Agostini P, et al. Postoperative pulmonary complications following thoracic surgery: are there any modifiable risk factors? Thorax 2010;65(9):815–8. Lugg ST, et al. Long-term impact of developing a postoperative pulmonary complication after lung surgery. Thorax 2016;71(2):171–6.